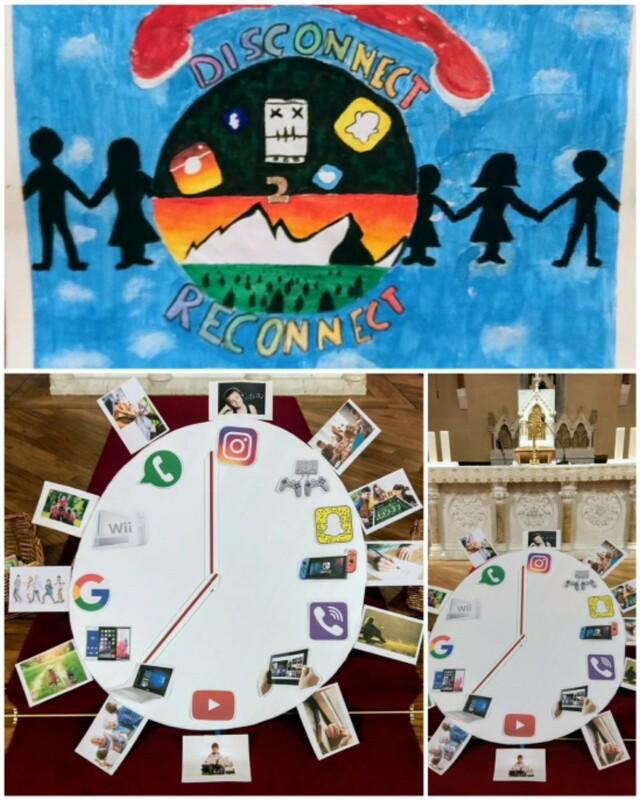 The theme of the Mass was ‘Disconnect to Reconnect’. In the Gospel, Jesus was reconnecting with his roots as he read from the scroll of the Prophet Isaiah in the synagogue where he grew up. As adults and children we are encouraged to disconnect……to take time away from our phones and tablets…..to put them down and to look up! It gives us the opportunity to reconnect with ourselves and others, and not live our lives through the lense of a phone or screen. 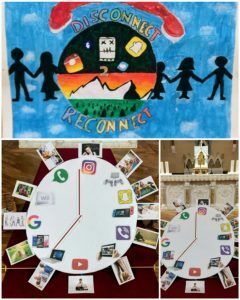 The clock on the Sanctuary reminded everyone how valuable our time is and how important it is to use our time wisely. The numbers on the clock were replaced with icons of the many apps and devices that preoccupy our time. On the outside of the clock are alternative ways in which we can spend our time in a positive, productive way. Each student prepared a tablet and on it they made an internet-safety pledge which will guide them and others when they use modern technology. I will always tell the truth about what I am doing on my phone or computer. Not telling the truth takes away your trust in me and it’s really hard to get that back. I will not use my phone/computer to do anything mean—no bullying, no teasing, no being rude. I will not take pictures of people and post them without permission. My social networks are limited to (e.g. Facebook and Snapchat). We will discuss adding more later when I show you responsibility using these. I will put my phone/iPad in the kitchen every night by ________p.m. and I understand this phone is yours—you will check it whenever you want to, to keep me safe. I will always report any unusual online behaviour to my parents/guardians as well as any behaviour that scares or worries me. My mobile phone is a way for me to communicate to my parents. I will not give my PIN or password to any of my friends. I will not download or use any apps, nor will I visit any sites that have been “banned” by my parents/guardians. I will give you my PIN codes and passwords. I will only accept friend requests from my “real-life” friends. This phone/computer will not turn me into a rude person; I will not answer it while in a restaurant, movies or while talking to another human being. I understand that I am responsible for where my phone, iPad or laptop is and for keeping it in good condition. I understand that having my phone/computer is a privilege, not a right. If I abuse this privilege my phone will be taken off me. I will not give out my personal information on the internet. I will make sure my profiles are set to private. Ashbourne Donaghmore Parish News is proudly powered by WordPress.